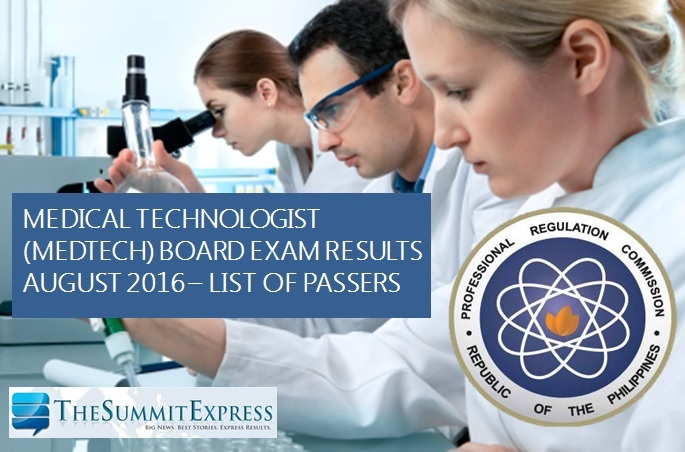 Those awaiting results of August 2016 Medical Technologist (MedTech) board exam can find here the full list of passers, top 10 (topnotchers), top performing schools and performance of schools as the Professional Regulation Commission (PRC) and the Board of Medical Technology released results in 3 working days after the exam. PRC on Thursday announced that that 4,144 out of 5,126 passed the Medical Technologist Licensure Examination. PRC has conducted the second board exam for medical technologists this year on August 27 and 28 in the cities of Manila, Baguio, Cebu, Davao, Iloilo and Tuguegarao. Medtech board exam covered the following subjects: clinical chemistry, microbiology and parasitology, clinical microscopy (August 27); hematology, blood banking and serology, hispathologic techniques, cytotechnology, medical technology laws, related laws and its implementing rules and the code of ethics (August 28). According to PRC, the target release date of Medical technologist board exam results is on Wednesday, August 31, 2016 or in 2 working days after the exam. In the same period last year, results were available after 3 working days. A total of 4,048 out of 4,840 hurdled the tests. In March 2016, results were also released after 3 working days. 2,046 out of 2,596 passed the Medical Technologist Licensure. As August 29 was declared holiday, it is expected that results will be out online by September 1. The Summit Express will update this page immediately once results are out online. Like Us on Facebook, follow Us on Twitter to receive more relevant updates.